Far left, Gary Cathey, 2018 Fall Tour Chair and Dr. Susan Dollar, Fall Tour Committee Member accept a $1,000 donation from the Calico Belles to promote the APHN Fall Tour of Homes. Representing the Calico Belles are, from left, Emma Giddens, Kadence Creamer, Bailey Barnhart, Olivia Walker and Madison Martin. The Belles pictured represent NSU Middle Lab School, St. Mary’s H.S. and Natchitoches Central H.S. 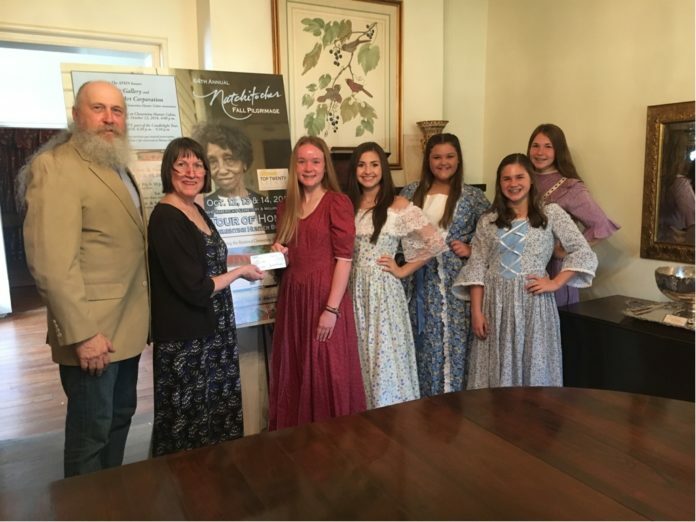 For the second year in a row the Calico Belles have made a one thousand dollar donation to the Association for the Preservation of Historic Natchitoches to be used in promoting the 64th Annual Fall Pilgrimage and Tour of Homes. This year’s tour will be held on the weekend of Oct. 12–14. Over 60 young ladies of high school age in the Natchitoches area belong to the group under the direction of Gretchen Murchison, APHN Board Member. These young ladies represent Natchitoches beautifully, and their service to the community builds the love of history and preservation in a new generation. Many Calico Belles have gone on to continue their involvement later in life by belonging to the APHN, serving on its Board, and some even share their historic Natchitoches homes on the tour. It is common for the granddaughters and great granddaughters of founding members of the APHN to continue their families’ tradition of supporting preservation in Natchitoches. It is also a way for newer members of the community to get involved. Tour tickets may be purchased by calling (318) 379-0055 or by visiting melroseplantation.org.